This post is about the fifth and sixth of seven principles of magic that were laid out in The Kybalion. You may wish to read the principles of correspondence, mentalism, vibration and cause and effect. The law of polarity says that everything can be separated into two wholly opposite parts, and that each of those still contains the potentiality of the other. This means there is a chance that in the future one thing will exist as the other. Beyond this, you cannot qualify the dual parts. No event is perfect or tragic in it’s entirety. There is both good and bad in everything in the Universe including you. There is a balance between opposites. Remember before when I said, “Witchcraft is a Science, an Art, and a Spiritual Practice.” Well this is some science, specifically some physics, more specifically Wave Particle Duality. Leading scientists and those in the quantum world have observed that light does not always behave in the same way. The observer will see light behaving in some strikingly different ways depending on the kind of experiment they do. Sometimes it behaves like a particle, and sometimes it acts like a wave. So, particles have the potentiality of waves and waves have the potentiality of particles. White has black, low is also high, slow exists with fast. The same holds true for elation and depression, sun and moon, kindness and cruelty, earth and sky, magical and mundane and so on. Now, take a minute to view the situation from another perspective. Because of the Principle of Polarity we know that there must be a positive potentiality associated with this event. Try to think of the reasons to feel positive emotions you may feel in spite of this seemingly negative event. They are there. When you can view life from both perspectives, life and your emotions become more balanced. This is what the Principle of Polarity is all about: balance. You only need to recognize that every time an event causes you to feel an extreme emotion, you are creating an opportunity to experience an equal but opposite emotion. One-sidedness is merely an illusion. Once you realize this, you will find that the world is a completely balanced system. Save your notes, if you made any, as a reminder that every event is polar. In the future, to help you recognize this more easily you may opt to write in a journal every time you feel extreme emotions due to an event that has occurred in your life. 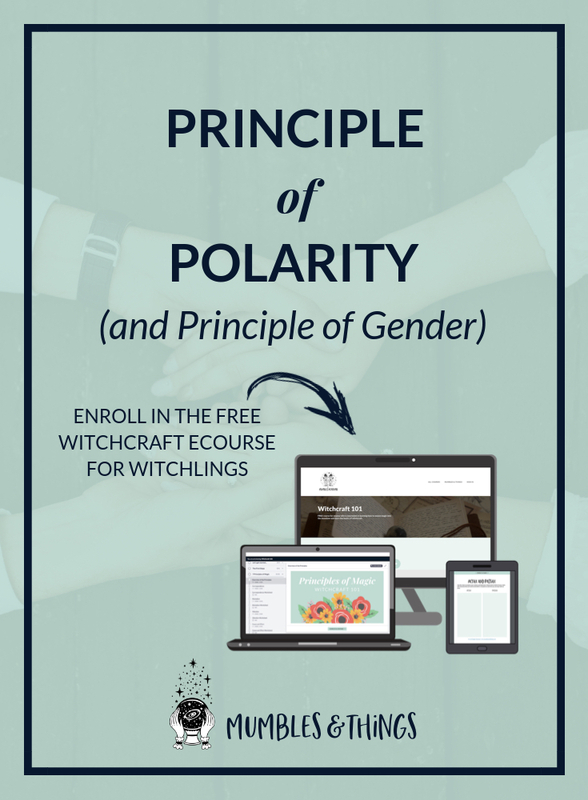 The Principle of Gender focuses on one specific polarity: masculine and feminine. Upon first learning about this principle I shied away from it because at first I thought it was telling us that every thing is one or the other. In fact, it’s the opposite. The Principle of Gender states that everyone and everything expresses both masculine and feminine properties. It’s a balancing act between the male and female aspects within self and also balancing the heavenly and earthly aspects within self. That said, I don't particularly agree with our ancestors in their labelling of this principle use of these words. As a society, we are evolving away from using masculine and feminine to describe certain traits. For the remainder of this post (and for future posts discussing this principle) I will use the word "active" in place of masculine and "receptive" in place of feminine. So what are these active and receptive energies? The active energy is always in the direction of giving out or expressing and deals with the will and actions. It can be compared to an extraversive personality. The receptive energy is always in the direction of receiving impressions, by generating new ideas, thoughts and concepts, including the creations of the imagination. It can be compared to an introversive personality. There must be a balance in these two forces. Without the receptive, the active is bound to act without restraint, order, or reason, resulting in chaos. The receptive alone, will constantly reflect and fail to act, resulting in stagnation. When the active and receptive energies are balanced, there is thoughtful action that results in success. You see? 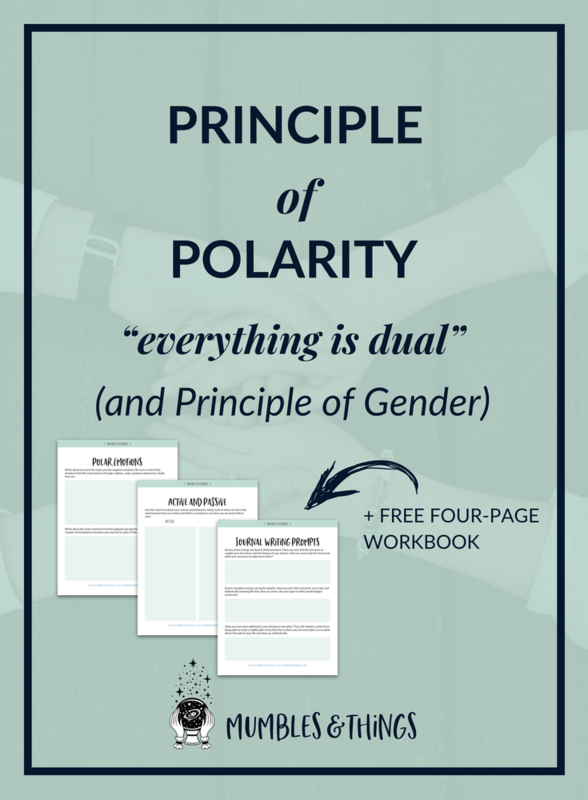 This Principle is simply a more specific version of The Principle of Polarity: two opposites that are also the same. Where do you see active and receptive energies in your own personality and behaviors? Save your answers and revisit them to remind yourself. Add to and alter them periodically. Make note of how you change over time. If you’d like to share your experiences or perspective, please do so on the Mumbles and Things Facebook page or comment below.